FAIRFIELD, CT - Horizons at Sacred Heart University has received a $50,000 grant from the Insurance Industry Charitable Foundation Northeast Division, which will help fund a year-round STEM curriculum. Horizons at SHU allows young students in Bridgeport to develop skills that will help them succeed in school and guide them toward the path to college. 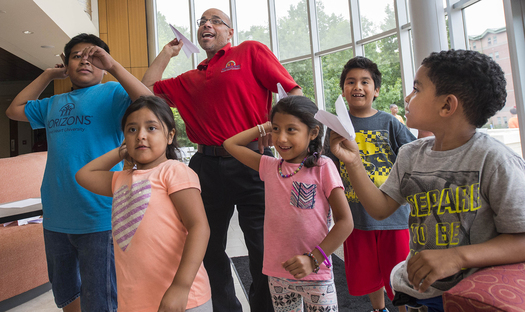 As the program enters its sixth year, it plans to expand its offerings, which tackle the issues of summer learning loss and opportunity gaps—problems that affect many children from low-income families. Since 2016, with the support of Horizons National, Horizons at SHU has developed a STEM collaboration with LEGO®, through which it plans to bring an exciting, engaging curriculum that is creative and educational. This includes the development of a new math curriculum, maker’s fair, and coding instruction and robotics programs for the middle school-age students. The Horizons at SHU program is part of an award-winning, national organization comprising more than 50 chapters and serving more than 5,000 students. Founded in 2012 within the Isabelle Farrington College of Education, Horizons at SHU has since grown to approximately 150 students ranging from kindergarten through seventh grade. All students come from Bridgeport at the time of their acceptance, and all are from families with incomes below the poverty line.